Researchers direct their nanoparticles to fight breast cancer, slow cataracts and heal injured blood vessels. Take a pill or receive an injection, and there’s sometimes a problem. The medication may address the issue, but the rest of the body gets a drug it doesn’t need and that might have side effects. What if science could instruct drugs to behave like this: Concentrate in the arterial damage area. Or where that cataract is forming. Or where that malignant growth is situated. Nanoparticle-based therapeutics is an evolving frontier of science in which two UT Arlington researchers have become nationally prominent. Put simply, their treatments target specific parts of the body without flooding everything else with unneeded drugs. It’s a welcome extension of the most basic tenet of medicine: Do no harm. Working on separate projects, the pioneering duo are Kytai Nguyen, a bioengineering assistant professor, and Wei Chen, a physics assistant professor and adjunct editor for American Scientific Publishers. Dr. Nguyen recently received a National Institutes of Health grant for her research, while Dr. Chen has secured funding from the Department of Defense cancer program, National Science Foundation, Department of Homeland Security and U.S. Small Business Administration with Agiltron Inc. in Boston. Nguyen’s work follows a $260,000 Scientist Development Award from the American Heart Association last year with results so encouraging that the NIH increased the funding. The idea is to develop platelet-mimicking nanoparticles that can carry drugs to injured blood vessel walls after cardiovascular interventions such as angioplasty or installation of a stent. Angioplasty is a technique used to dilate an area of arterial blockage. The American Heart Association estimates that doctors perform more than one million angioplasties a year. A catheter with a balloon-shaped tip is inserted in an artery and positioned near the blockage. Inflating the balloon pushes the blockage toward the arterial wall and expands the artery to restore blood flow to the heart. But these interventions often injure the vessel wall, leading to pathological conditions such as inflammation and restenosis. Restenosis is the narrowing of an artery that was previously opened by an invasive procedure. Installing stents—small pipes inserted to keep arteries open—is also commonplace, with about 900,000 procedures performed annually. 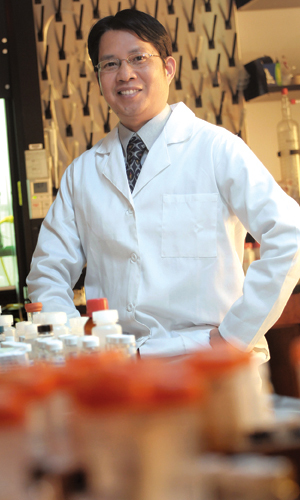 Nguyen’s strategy is to load nanoparticles with dexamethasone, an anti-inflammatory drug. The nanoparticles are made of biodegradable polymers, which means that eventually they would break down and be eliminated through normal bodily processes. But here’s the tricky part: The body accepts the nanoparticles as platelets, a blood component essential to healing. That, she theorizes, will be the result of her nanoparticle research involving arterial damage. As the nanoparticles break down, they release an anti-inflammatory drug bonded to them, hopefully improving the healing process. Nguyen also postulates that when angioplasty is ineffective and stents are installed, the anti-inflammatory drugs could be incorporated into the stent itself. By the time the drug is expended, the damaged cells around the stent would have healed themselves. This “drug-eluding stent technology” is research for another day, though perhaps in the near future. Using nanoparticles as an agent for medical applications borrows extensively from chemical engineering and bioengineering. So using mechanical devices for internal medicine—albeit microscopic nanoparticles—to treat health challenges is a natural progression. Nguyen’s in vitro research and tests are progressing as planned. She hopes to begin animal testing in two years on rats with balloon-damaged arteries. “Since we’re essentially talking about a new drug treatment, it may take several years before it becomes standard medical practice,” she predicts. 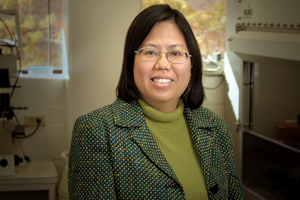 Though her current interest mostly focuses on cardiovascular disease, Nguyen believes using nanoparticles to treat prostate cancer cells is possible, too. She has received a $484,000 grant for research in that area from the Department of Defense. Physicist Wei Chen is also shedding light, literally, on nanoparticle therapy research. Like Nguyen, he is interested in targeted nanoparticles, specifically chemotherapy drugs for breast cancer. He wants to develop a process during which the release of medications can be turned on and off, typically in tandem with exposure to a spectrum of light. Traditional medical science tends to view fluorescence as an application of medical imaging—it helps physicians see inside our bodies. By utilizing nanoparticles infused with medication, such as photodynamic drugs, Chen expands the technology to release drugs only in the diseased area. The light illuminates the nanoparticles, which then transfer their energy to activate the drugs so they will produce toxins like singlet oxygen for tumor cell destruction. The toxins would be generated in only the area receiving the light, and that release would stop when the light was turned off. Photodynamic therapy has proved successful for some types of skin cancers, but there’s an obvious challenge for deep cancer treatment: How does the light to activate the drugs get inside the body? “In the nanoparticle-based photodynamic treatment I propose, the light is actually provided by a radiation source like an X-ray that can penetrate deeply into the body,” Chen says. He also has created “afterglow nanoparticles” within which luminescence lasts awhile after the excitation is off. Afterglow materials have been used for emergency lighting, but Chen envisions a more lasting drug activation. Department of Defense congressionally directed medical research programs are funding this work. Lessened chemotherapy side effects and fewer consequences of radiation treatments have enormous appeal to the medical industry and cancer patients. The technique also offers hope for attacking tumors deep inside the body. It likely will be four to five years before the first trial projects on a few select human patients can be implemented. Not that there isn’t pressure to do so. Chen has received requests from desperate people volunteering to take the experimental treatment. But it’s far too early for that, with animal trials yet to come. In the meantime, Chen’s nanoparticle fluorescence has ramifications from battling cataracts to detecting uranium shipments. Cataracts affect 20.5 million people in the United States, and one out of five people over age 75 will have a cataract procedure. The federal government spends $3.4 billion in Medicare costs each year for cataract surgeries. The UT Arlington researcher proposes custom-designed nanoparticles that have a chemical attraction to the cataract. Flooding the eye with light would activate the treatment chemical. He is collaborating with Barbara Pierscionek in Vision Science at the University of Ulster and Ron Schachar, an adjunct physics professor at UT Arlington and a senior director of ophthalmology at Pfizer Corp.
Chen believes that cataracts could either be stopped or slowed so dramatically that surgery would not be necessary. Patients would just need an occasional nanoparticle fluorescence treatment. An unexpected side benefit to the fluorescence research involves a Department of Homeland Security grant that would use the technology to detect shipments of uranium or other radioactive materials, critical concerns because of their potential use in nuclear terrorism. “Though there are many variables involved, I believe this can be accomplished with considerable efficiency and reliability, and at a relatively low cost,” he says. The research will be conducted in collaboration with UT Arlington high-energy physicist Andrew Brandt and Alan Joly at Pacific Northwest National Laboratory. Chen’s work has been a veritable grant magnet. Before joining UT Arlington, he worked six years at ICx Nomadics as a group leader and leading nanotechnology scientist. He has received 10 Small Business Innovation Research/Small Business Technology Transfer grants with total funding of $3.5 million. Though it may be a decade before their research becomes standard practice, Kytai Nguyen and Wei Chen are bold explorers in a world of experimental medicine where few have ventured.